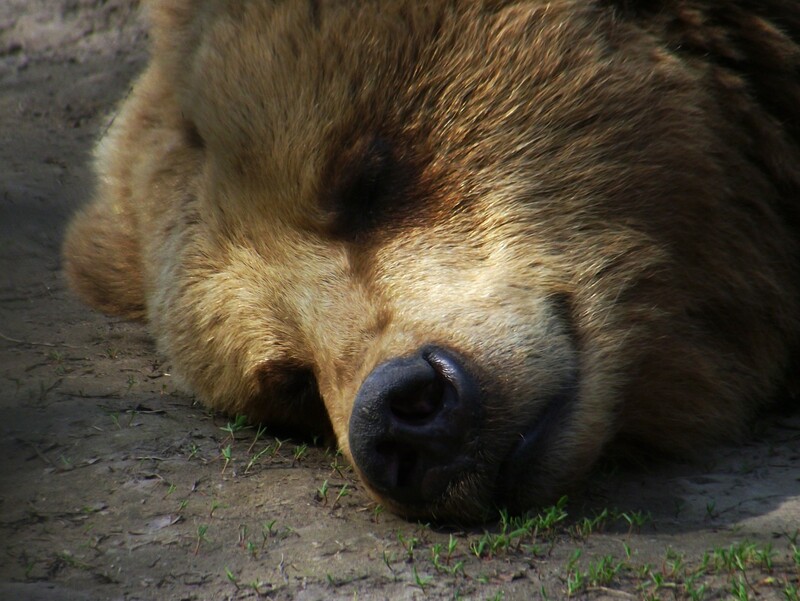 When you think of hibernating wildlife, do bears come first to mind? They’re well-known for hibernating all winter long. They crawl into dens and spend the winter there, mostly sleeping. But scientists aren’t so sure they meet the definition of hibernation. They don’t follow the flow of so-called true hibernators. Their metabolic rate and temperature are much less depressed than with other hibernating animals, and they awaken easily and may occasionally leave their den. Also, pregnant females deliver and care for their cubs in winter dens. 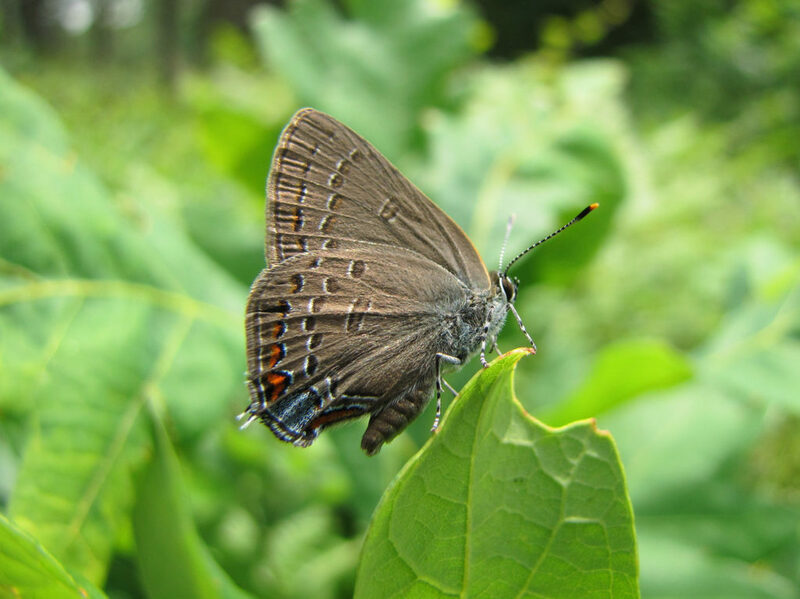 Butterflies and moths don’t have insulating fur or feathers, and being cold-blooded (unable to regulate their body temperature) they’re the same temperature as their surroundings. They’re warm when it’s warm and cold when it’s cold. If it’s freezing, they freeze. So what becomes of these lovelies we enjoy so much from spring to late fall? Some migrate south to a warmer climate and move back north in the spring. (The Monarch Butterfly, Danaus plexippus, is a famous example.) Most, however, stay in our yards all winter, hibernating in one stage or another of their life cycle, sometimes in plain sight if we know where to look. 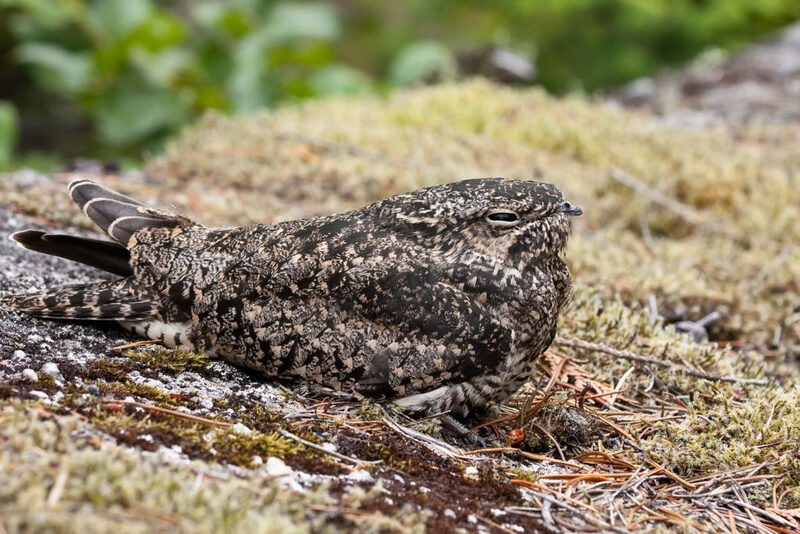 Some species hibernate as adults in any spot that keeps them out of sight of predators and away from winter winds—places like tree cavities, beneath loose tree bark and in unheated buildings. Others hibernate as eggs, caterpillars or pupae. 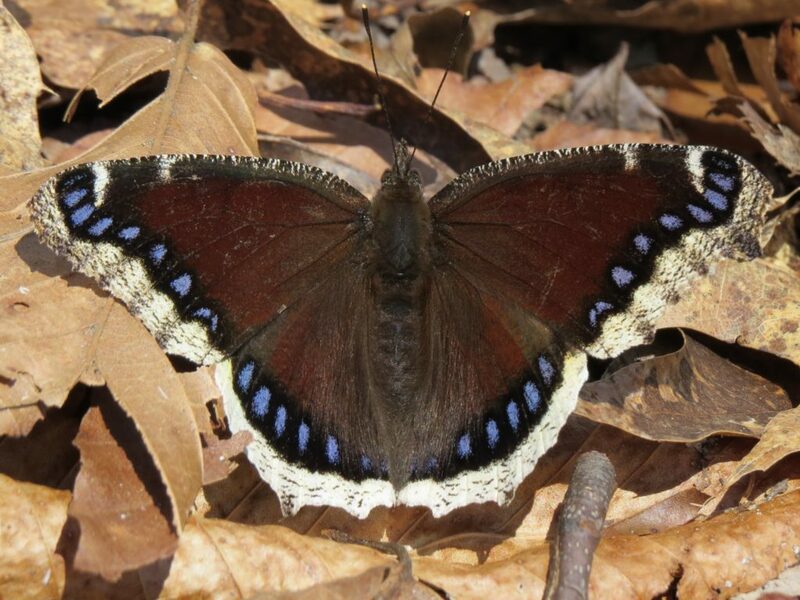 Mourning Cloaks, Nymphalis antiopa, overwinter as adults. (Fyn Kynd / Flickr; cc by-sa 2.0). Okay, but how do they do that without a “winter coat” of some kind? The secret is in their body chemistry. Before winter arrives, they begin secreting a natural “antifreeze” into their body fluids to keep them from freezing. It’s a combination of chemicals that include sorbitol and glycerol and works like antifreeze does in our car radiators. Other insects also hibernate in one or another of their stages of life. 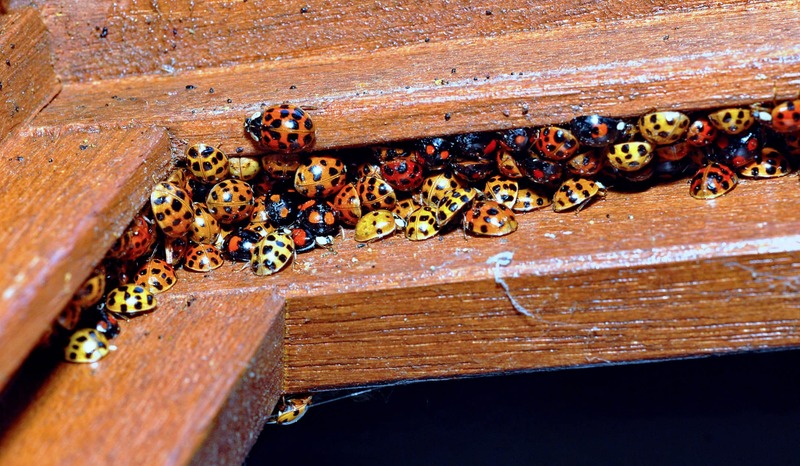 The Harlequin Lady Beetles shown at the top of the page are hibernating as adults in a windowsill. 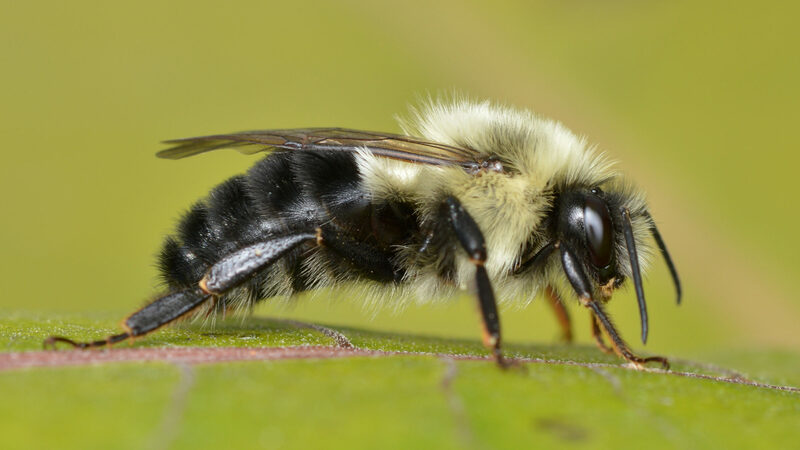 Queen bumblebees1 rule over a busy nest of their children all summer long. But their offspring die in the winter, leaving them to endure alone the cold months ahead. They leave their nests and bury themselves underground to survive off of their body fat. If they don’t put on enough fat (derived from nectar) to get them through the winter, they die. Like butterflies and moths (and other insects, as well), if their surrounding temperature drops to freezing, their body produces a natural antifreeze to prevent ice crystals from forming. You’ve heard of cryogenics, a process used by physicists to produce incredibly low temperatures and sometimes suspended animation. We usually read about it regarding the preservation of human eggs, sperm and blood cells. Well, it so happens that nature does that naturally for some animals. 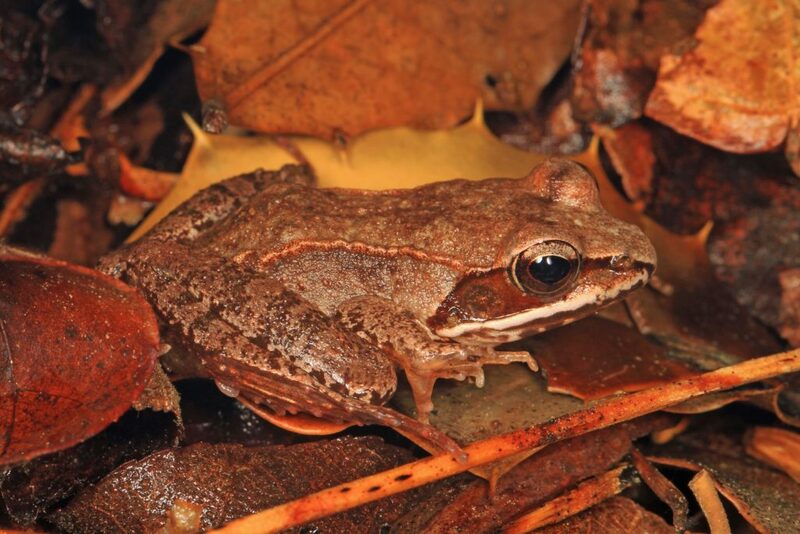 A good example is the North American Wood Frog, Lithobates sylvatica, the most widely distributed amphibian in North America. Only about 2 inches (5 cm) long, they’re found mainly in wooded areas, from the tree line of the Arctic Circle south through the eastern half of the United States to Georgia. Did you catch the part about the Arctic Circle? Yes, these little frogs survive winter up there! They spend winter with their body flooded with natural cryoprotectants, the only frogs that do. Lying under leaf litter and other organic detritus on the forest floor, their body prepares for freezing weather in two critical ways: Urea (a highly soluble, nearly non-toxic component of urine) collects in their blood. And, their liver glycogen converts to glucose—at 50 times more concentrated than those in a diabetic human—as a response to ice forming in their body. (Commercial antifreeze is made of a sugar alcohol similar to glucose.) Together, the urea and glucose act as “cryoprotectants” to limit the amount of ice that forms and to reduce shrinkage of cells. Whoa there! Watch where you’re stepping! Birds are noted for either migrating in winter or staying in their year-round habitat to meet its challenges head-on. This one, though, is decidedly different. Careful, it might be on the ground at your feet! Common Poorwills (Chordeiles minor) are the only birds known to “hibernate.” They enter a state called “torpor,” not quite as deep as hibernation, but just as effective. Their metabolic rate slows down, and body temperature drops. This allows them to endure long periods when their primary food, flying insects, isn’t available. Studies show they remain completely inactive for as much as 90 percent of the winter. 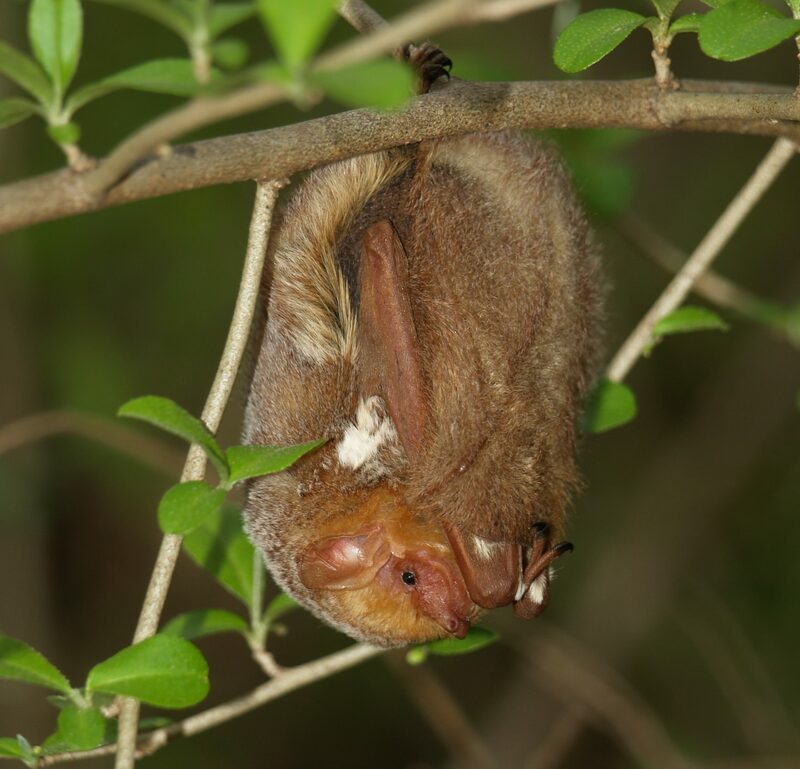 The features of the Eastern Red Bat (Lasiurus borealis) shown below are a bit hard to discern because it’s partially wrapped in its long, furry tail membrane. Unlike many other bat species, this one doesn’t roost or hibernate in caves or mines. 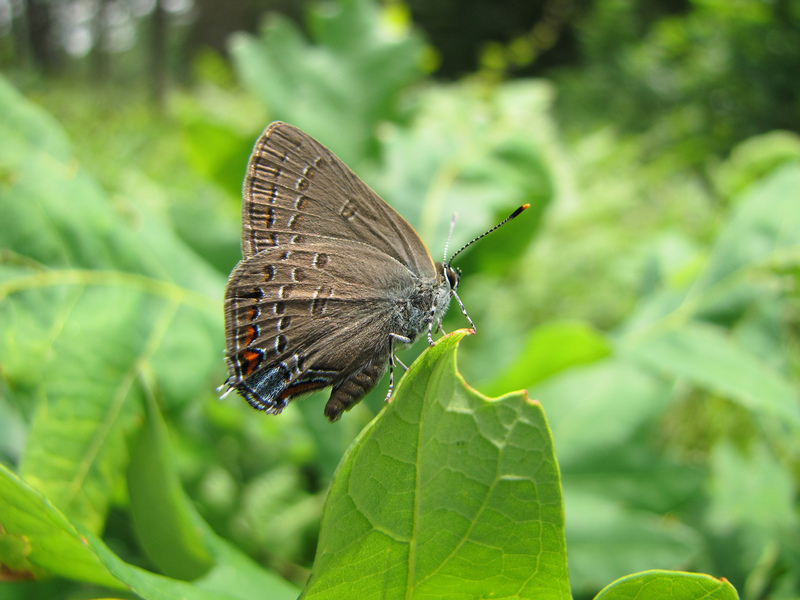 Instead, they spend summer in trees and also hibernate there in winter, hanging in tree hollows or even on exposed tree trunks (there are some reports of finding them under leaf litter on the ground). Their fur is long, silky and warm, and they can use their tail membrane like a blanket, wrapping themselves almost wholly within it. If temperatures drop too low, they’re able to raise their body temperature enough to keep from freezing to death. If despite these advantages they should get too cold, they can survive a body temperature as low as 23 °F (-5 °C). 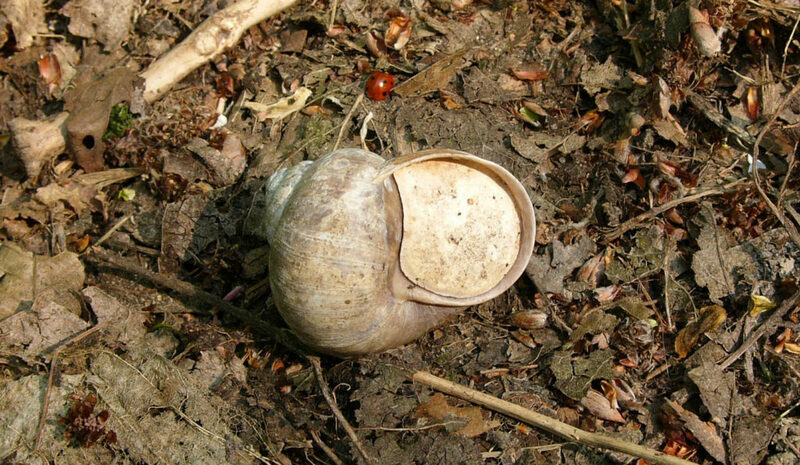 Land snails carry their hibernaculum with them—it’s their shell! They fatten up ahead of winter and then burrow into soil or under leaf litter for a safe place to hibernate. 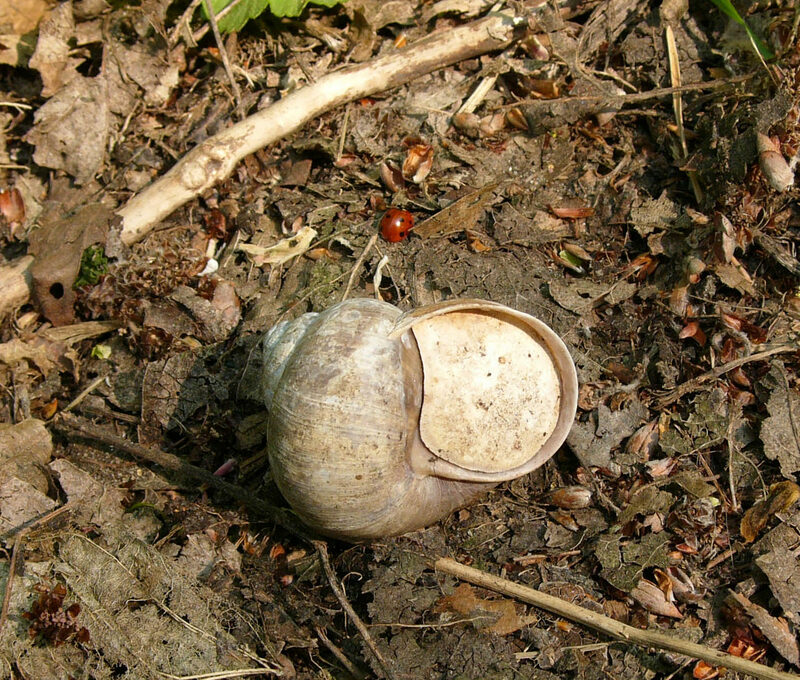 They seal up the opening of their shell with layers of dried mucus called an epiphragm. The epiphragm is vital. It sometimes protects them from predators, but more importantly, it seals in moisture. In any season of the year, snails must stay moist to survive. 1 Bumblebees hibernate, honeybees do not. Honeybees stay active in their hive and live off their stored supply of honey.